Makes the Palace look grander and more fancy. Featuring 6 new interior cells + new quest. 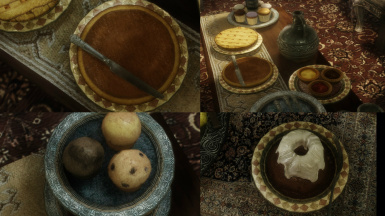 A tremendous amount of works from the other people are granted and used in this Mod. Do NOT re-upload any part of my work to any other website. My Mod is NOT a huge storage of the modder's resources. I am truly grateful for all those who has supported me with their wonderful creations which made my mod possible to be made, and with their kind words which was the source of my motivation in creating. Any part of my work was NEVER possible without the dedication of the amazing and creative people who shared their wonderful creations in the name of the "resources", allowing us to download and include them in our works for free with open heart. I have read and followed their terms very carefully, and the following resources are used without asking these authors for their permissions by the right they've granted the users to do so. I hereby would like to show my greatest thanks to the following authors for their amazing resources that are used and are essential for making my Royal Blue Palace possible. Thank you, InsanitySorrow, for your Curtains, Food Stuffs, Washing Stuffs, Clutter Stuffs, Static Armour Stands, Bath Towels, Paintings, Junk Yard, Shields and Blankets. Thank you, Darkfox127, for your Creation Kit Tutorials and Resources (http://www.nexusmods.com/skyrim/mods/53956) and your great video tutorials. I wouldn't have known to do what I managed to do without your teachings! The following is the list of the people I would like to thank for granting me the unexceptional permission and openly shared their great works with me, even though they were not uploaded as resources originally. 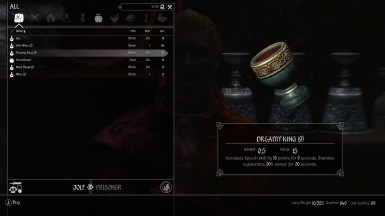 JadeRoyale, an author of the amazing "Pottery Recolor" (http://www.nexusmods.com/skyrim/mods/40736)! 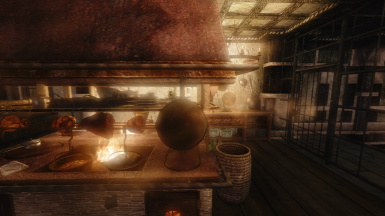 His Retexture Mod offers a variety of choices of colours for glazed pottery in Skyrim, giving them new special appearances. Some of his recolours are used in my Blue Palace. You need to try his Mod out! Born, an author of the beautiful "BTRH Waifu"! 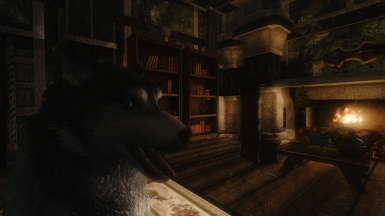 Nightshade, an author of "Solitude HD Gate" (http://www.nexusmods.com/skyrim/mods/49829)! 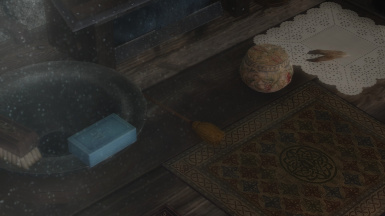 His Retaxture Mod for the gate door in Solitude is very elegant-looking. The same texture is used for the door at the Pelagius Hotel. 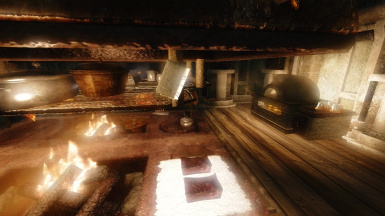 Rand0mNumbers, who created the awesome "Frying Pan Weapons" (http://www.nexusmods.com/skyrim/mods/19246)! His wonderful frying pan models can be seen at the palace kitchen. 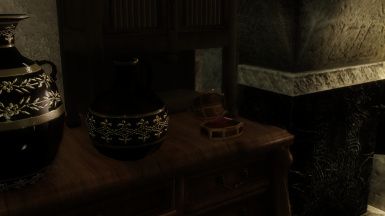 Denki Groove, a creator of "Handbag Addicts" (http://www.nexusmods.com/skyrim/mods/41280)! 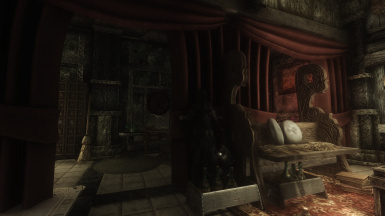 A handbag and an umbrella inside Falk's private room are those models from this Mod! Wanna get yourself a handbag too? Go and download the original Mod! 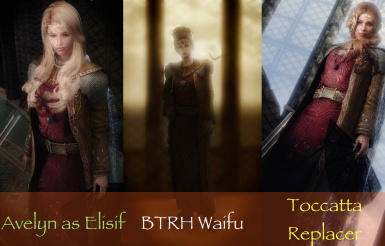 Kris Takahashi, who allowed me to release a compatibility patch for his great "Interesting NPCs" (http://www.nexusmods.com/skyrim/mods/8429)! 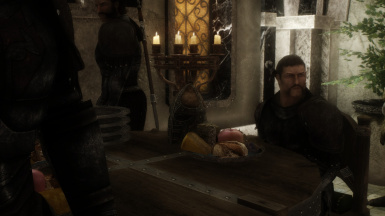 Ripple for allowing me to release a patch for everybody's must have mod "Inconsequential NPCs"(http://www.nexusmods.com/skyrim/mods/36334/?)! 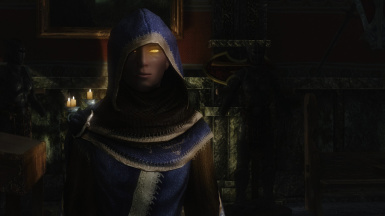 And, Lind001 for allowing me to use the amazing blue robe texture from Lind's Court Wizard Robes - Blue Robes Texture Replacer(http://www.nexusmods.com/skyrim/mods/59734/?)! For the Beta testing, I wanna thank my dearest supporter Indycurt. Thank you Curt! - Renewed the BSA archive. It includes a few new assets and a new script. Removed unnecessary scripts from the previous archive at the same time. - Interior change: Blue Palace (the Main Hall) was very laggy, but in this update I hope many of you will notice it's became lighter. - Interior change: Some minor changes and fixes to Blue Palace (the Main Hall). 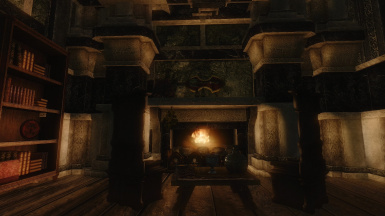 Also, fireplaces in many of the interiors have been given the corresponding sound effects. - New Assets: Now, the wardrobes in Sybille's room can be opened to see what's inside for yourself! - Compatibility Patches with Lighting Overhaul Mods: The patches with ELFX and Shadows are completely redone. The patch with ELFX now requires ELFXenhancer.esp as one of the master files. No changes were made to the patch with RLO. 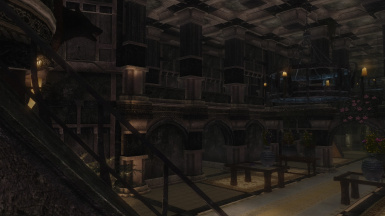 - Pelagius Hotel Fix: In some occasion, you'd still seen the bars and ropes around the entrance to the Hotel, even though you've finished the relevant quest. This is assumed to be caused when the scripts get stuck with other scripts from your other mods interrupting them, and now can be resolved by typing in "startquest pelagius" in your console command. Yo, I'm back from Hawaii. Here's the first update for 2016! - Renewed the BSA archive. This includes all the missing facegen data for the newly-added NPCs and some new scripts. 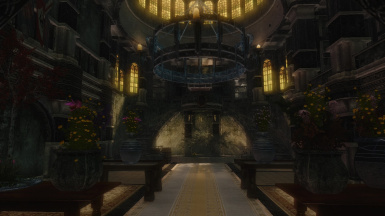 - Interior change: Blue Palace (the Main Hall) has had its lighting template changed slightly so that it would be a little brighter. - Interior change: Blue Palace (the Main Hall) has had it Room Markers redone, this will prevent any issues where you'd see some things behind the walls and the floors. - Interior change: Minor, but some very noticeable changes to Blue Palace (the Main Hall), The Stewards Chamber, and The Pelagius Hotel. - NPCs change: Overhauled the Palace Guards. Their faces have been remade, their daily routine for patrol has been rescheduled. - New Assets: A brand-new plaque for the Pelagius Hotel. Sybille's bed is now colored red to match the room's layouts. 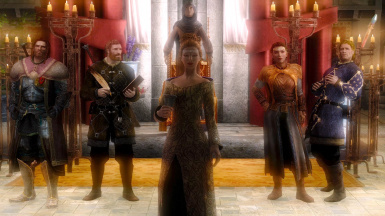 - For Inconsequential NPCs users: The Foreign Envoys were standing still even after the conversation of that Dragonbridge lad (alas, I forgot his name) with the members of the Court. This is due to the minor mistake in the conditions setting in their AI packages in the original mod. It has been corrected, so that they will interact with Elisif more often. - Some more Blue Palace-related fixes by USKP have been carried out, including dialogue scenes of Thanes. e.g. Bryling and Falk's secret meeting converstaion will not take place inside Blue Palace, and so on. - The Solitude Guard may have said to you "Been up to the Blue Palace? Sight to see." even when he is in Blue Palace already. This issue hasn't been touched even by USKP, so I've fixed it so this dialogue line won't be triggered inside Blue Palace. - AI Packages Fixes: Somehow the AI package for Irnskr and Melaran to relax in the palace lobby wasn't correctly scheduled. - Pelagius Hotel Fix: The Hotel didn't spawn correctly, even after finishing the relevant quest. 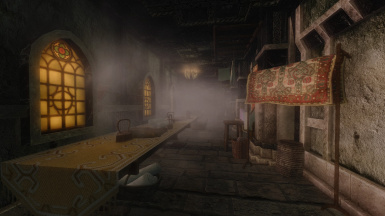 - Pelagius Hotel Fix: The room rental script was not working at all, so I discarded the new script so you can rent a room for the same price as a normal inn. 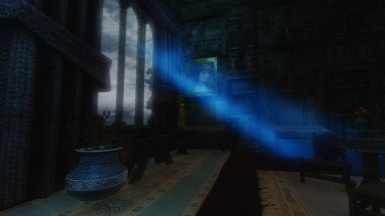 - Interior change: Blue Palace (the Main Hall) has been give a new lighting template, which gives us a little more "lit" feel. - Interior change: The Room Markers in Blue Palace (the Main Hall) has been reworked for better performance. Well, hopefully. 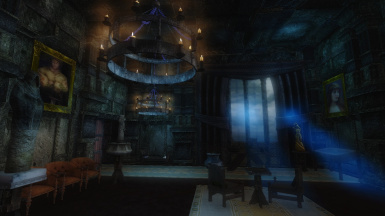 - Interior Change: Tweaked the entrance area in Blue palace (the Main Hall). - Interior change: The Stewards Chamber has been redone to be more architecturally authentic. - Interior change: Some more minor fixes/tweaks here and there, in every interior cell. 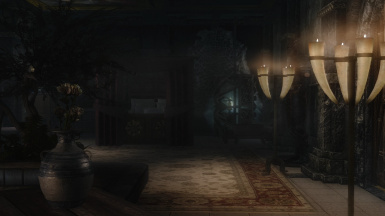 - New NPCs behaviors inside Blue Palace (the Main Hall), such as drinking with a goblet, reading a note etc. 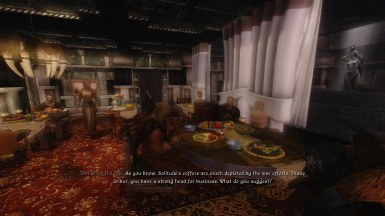 - The price for renting Pelagius Suite is now 250 septim. Thought 10 isn't high enough. - New NPCs: Now every guard named "Palace Guard" is uniquely done, made from scratch (faces and all). This is not only to add some immersion but also avoid the nasty bug where the guard enters the palace naked. The ELFX patch has been updated. Still super heavy, use at your own risk. No other patches have been changed. Damn this font is killing my eyes, thanks for reading tho. Vast changes have been brought in this update. - Every Interior: Many glitches and architecturally incorrect/unreliable structures have been fixed and the whole look has been improved by moving, removing, adding furniture/clutter items. - Blue Palace: Navmeshes in Blue Palace had many deleted records, which may have resulted in causing performance issues. Solved by re-creating Navmeshes from scratch. - Blue Palace: Newly-designed paintings. The paintings of Elisif are hanging in the Throne Room. 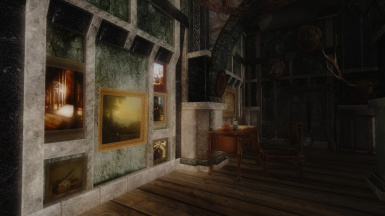 - Jarl's Living Quarters: Newly-designed paintings. Elisif and Torygg's paintings. 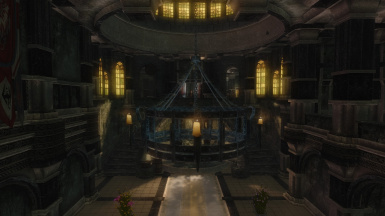 - Jarl's Living Quarters: Elisif's bath tab has hot water. - Jarl's Living Quarters: Elisif's bed is now a double bed so you may as well...ahem, it's a user's request, believe me. 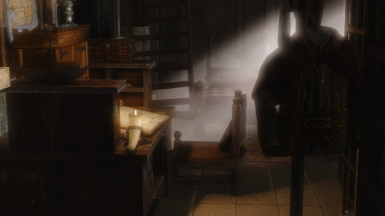 - Jarl's Living Quarters: New stuff for your taking. 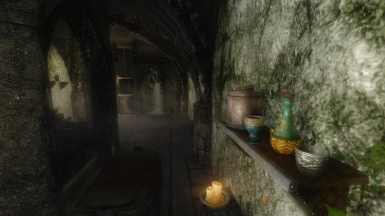 - Jarl's Living Quarters: Enhanced the lighting settings, for more relaxing atmosphere. - The Parlour: The garden area visible from the window is not the exterior anymore and is more like a small house garden made inside the room. - The Parlour: You can now share the same table with Elisif to dine. - The Kitchen&Landry: Removed unused "Old Rusty Door". - Elisif the Fair: All edits to her NPC records have been removed for no more compatibility issues. She used to be edited to give you a present if you're so close to her, but according to this removal of her records she will not gift you anymore. Her AI packages have been assigned to her alias in the quest "DialogueSolitude". - Elisif the Fair: Her bathing AI Package has been revamped so that she will actually use her bath tab to bathe. - Sybille Stentor: All edits to her NPC records have been removed for the same reason as Elisif. In the former versions she was dramatically strengthened to meet her reputation, to be one of the most powerful mage, but she is no more. Her AI packages have been assigned to her alias in the quest "DialogueSolitude". - Sybille Stentor: She will now wear a special blue robe with the texture by Lind001. - Falk Firebeard: All edits to his NPC records have been removed. His AI packages have been assigned to her alias in the quest "DialogueSolitude". - Melaran: Carried out USKP changes to him so that he will take Sybille's place to be the court wizard, if Sybille dies. - Solitude Guards: The change to their outfit has been removed. This prevents the so-called "naked guards bug", in which all the guards in the palace have nothing to wear. They will still remove their helmets when they entered the Palace, this has been achieved by the new script. - "Improved Blue Palace Courtyard" or "Better-looking Blue Palace Courtyard" will no more be supported. 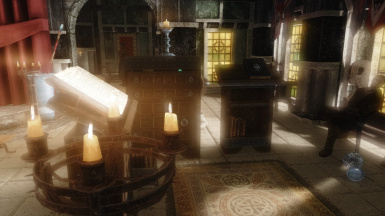 - Added the compatibility patches with Enhanced Lights and FX, Realistic Lighting Overhaul, Shadows, The Ordinary Women, and Legacy of the Dragonborn. - The bathing scripts have been re-written. - Now the Jagged Crown will be stored in the Palace only if you gave it to Elisif through General Tullius. 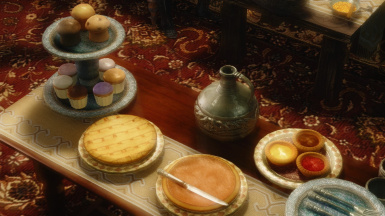 - It used to take 3 weeks in game time until the Pelagius Hotel is populated with 14 guests. This is no more, they will spawn at the same time the Hotel gets started. - Continued support for Interesting NPCs and Inconsequential NPCs. Fixed some disturbing glitches in some of the interiors. Changes to the courtyard version. I have replaced some of the objects added by the courtyard mod with static objects to prevent HAVOK from messing around with them! 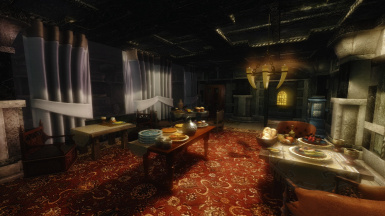 A compatibility patch for Lords of Skyrim and housecarls is added. Thanks to Curt, who was willing to be a tester finally the new quest is confirmed to work as intended. Many many interior fixes so that this 2.1 will be the last update to "fix" something for long. The garden (not the courtyard) which you can see from the inside the Parlour is enhanced. You can't go out there, enjoy the view from the window. Small enhancements are made to many of the interiors. Palace finally looks as it's supposed to be. 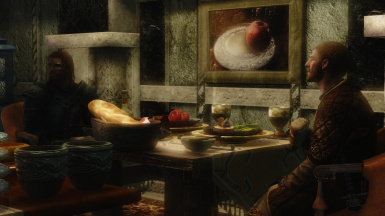 A compatibility patch for "Lords of Skyrim" is ready. Added a script folder which contains some crucial scripts that was lacking for the added/modified quests to function. Some of the files are identical to what's inside the BSA, but you never have to unpack the BSA to overwrite them. It's good as it is. When you walk or have a chat in midlle of the palace your footsteps or voices will echo reasonably and dramatically. Now Falk Firebeard will "properly" go visit his secret lover, Bryling, at night time on every Friday. Irnskr Ironhand, a housecarl for Thane Bryling and Melaran, a housecarl for Thane Erikur are now modified. Their newly added AI packs allow them to go defend their Thanes in the court's closing hour. Many of the AI packs are enhanced for the better activities. Of course, these AI packs are tested and made sure to work flawlessly. Room markers are renewed in Blue Palace interior cell. Now the dungeon area in the basement floor is touched. Difference is not very mentionable, but noticable. Sybille Stentor is set back to non-essential and now she can be killed. If you wanna give her a puch or two, get ready to be killed. She isn't mercifull. Update for 3DNPC Version. Nythriel's sandbox package to relax in Blue Palace is modified so that she can fully make use of the bigger palace layouts. Nythriel herself isn't modified. Small interior edits. Including some glitch fixes and adding new furniture at the entrance hall. Updates for Interesting NPCs version. This is to make the memorable court scene in the quest "The Guilt of Gales" more immersive, e.g. Bolgeir will defend Elisif during the scene etc. It doesn't edit the quest itself in any way, just adding some new AI Packs. Some reported that the guards in the palace are naked. I haven't encountered this problem before so it's hard to say what's wrong with my mod, but I made a small edits to the guards and hopefully they won't spawn naked ever again. Fixed the tempering recipe for the Jugged Crown. Compatibility patches for 3 major Elisif mods are ready. A small update for the 3DNPC compatible versions which includes tiny but effective fixes. Renamed and corrected the included BSA archive. 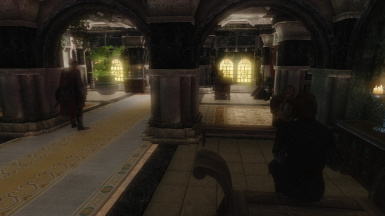 The new Palaces and Castles Enhanced is the latest version which offers even better Blue Palace and a complete overhaul of 4 other palaces in Skyrim. Renewed Everything. Simply Better, More Royal. Many thanks to your coolest video review, MxR Mods! 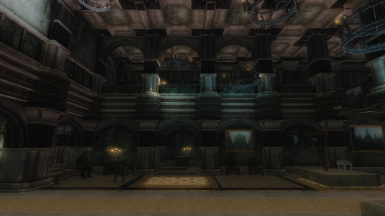 ・An expanded Solitude Blue Palace interior cell to be bigger and more like a grand palace that deserves to be held by the capital city of Skyrim. ・New AI Packages (daily schedules) for the NPCs regarding with Palace. 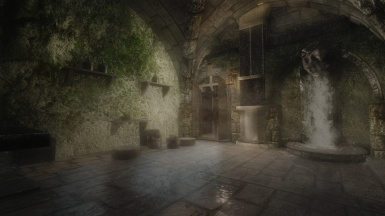 ・Several new interior cells including the Jarl's Chamber, the Stewards Chamber, the Parlour and the Kitchen & Laundry Room. 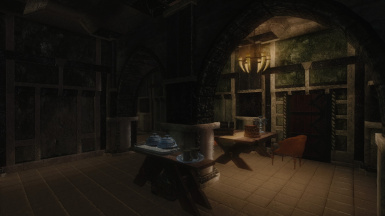 ・A new quest to refurnish the Pelagius Wing to make it into a hotel. ・Support for several popular mods users and my fellow Japanese users. Works best in New Games. After installing, you first need to open up the console to type in "resetinterior SolitudeBluePalace"
especially when you are installing this mod on an existing save. 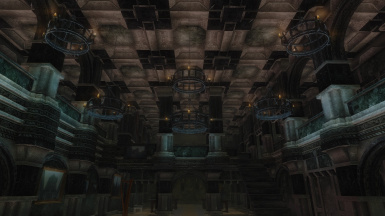 The architectural style and the very few lore tales of Blue Palace somehow always attracted me. 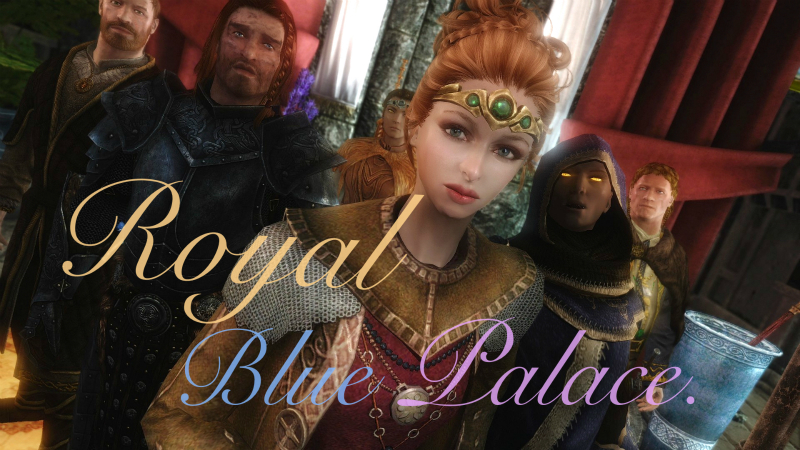 As much as I disliked the way the Palace was portrayed in the Vanilla Skyrim I loved it so much, and after over 7months of sitting in front of my screen, I can present you Royal Blue Palace. 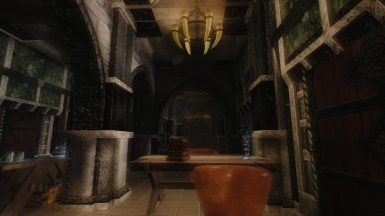 Beware that some rooms (like the Jarl's Chamber) aren't made to match the exterior. Most of the newly-added rooms are private spaces, meaning trespassing there will make them very angry. 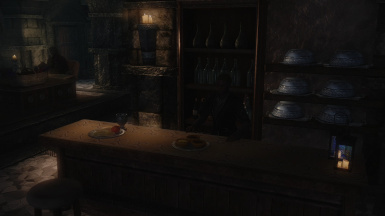 However, once you finished the quest "A Man Who Cried the Wolf" in which you're going to kill the necromancers in Wolfskull Cave, you will earn the court's trust and be granted to enter these rooms freely. The NPCs marked “☆” have not had their NPC records changed. Therefore you may use any mods that alter the appearance of Elisif, for example, without need of a patch. Sybille will be wearing a very special, gorgeous looking blue robe, with the texture from Lind's Court Wizard Robes Revamp. This robe is her own and you cannot steal it, so if you want that robe for your character please go download Lind's original mod. All of the newly-added interiors mentioned above will serve as their new workplaces/living quarters so everyone will be more lively, and busy. Falk will visit Bryling’s house at midnight once a week and even goes out to the Bard’s College Festival, if you helped Viarmo restart it. Sybille will not join the rest of the members of the Court when they travel to the Parlour to dine at 3:00pm. The Housecarls for the Thanes will show up at the Court in its closing hour to pick their Thanes up. Elisif will ask you to come over to her private quarters when she asks you to deliver Torygg’s War Horn for she doesn’t like to discuss the sensitive matter regarding with Talos worship in public. And finally, every noble one who resides in the Palace will bathe in the bath halls. Sybille, Falk, and Bolgeir will use the large bath hall in the Stewards’ Living Quarters and Elisif will use her own bathroom. When they bathe, they will unequip their clothes and store them inside the baskets near the baths, which gives you the opportunity to steal their belongings if you fancy yourself a sneaky type. The Palace is now full of things for the taking! There are even unique treasures including 2 jeweled daggers and 1 jeweled greatsword kept somewhere. the Jagged Crown to Elisif the Fair. But what has Elisif done with the bone crown? Well, she made a decision to keep it safe from the hands of the rebels. Where she's hidden it is a mystery...but the rumour is the last High-King Torygg had his own secret vault where he was keeping all of his treasure, and he was shearing this great secret with his beloved wife too. Jagged Crown will only appear somewhere in Blue Palace if you gave the Crown to Elisif through Tullius. 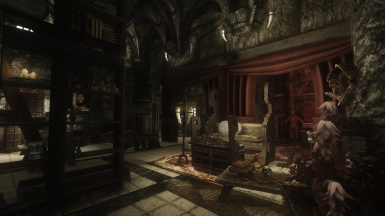 In the Jarl's Chamber there is a room named "Torygg's Study". Enter the room, and look for a locked wardrobe. This is the fake wardrobe with Expert+ leveled lock, once you breach it you'd find a button, and on the other side of the room you'd also find a handle. Press the button, activate the handle to open the gate and finally you'd see a door with master lock. Use all of your lockpicks to open and bum, you found the Jagged Crown! And the golden swords. " 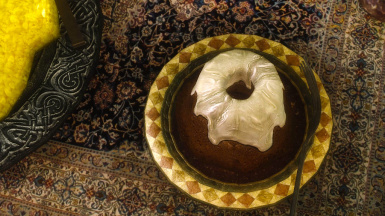 ・In Vanilla Skyrim, the Jagged Crown does not have a tempering recipe. So I've added one so you can temper the Crown at a work bench if you have the Steel Smithing Perk. 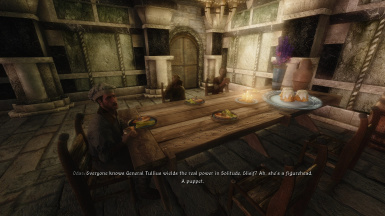 After finishing Sheogorath's quest "The Mind of Madness", you can go talk to either Elisif or Falk about what happened inside the Pelagius Wing and how it's became a "safe place" free from the daedric affection. your opinion about the restoring plans. You can advice them to make a guest hall insude the Pelagius Wing, and after the 7 days of refurnishing is completed, the brand-new "Pelagius Hotel" will be opened! ・A completely functional inn where you can stay at any time. ・For your efforts of recovering the Wing, you are granted to stay at the most expensive "Pelagius Suite" . ・A new beverage only served here at the Hotel! 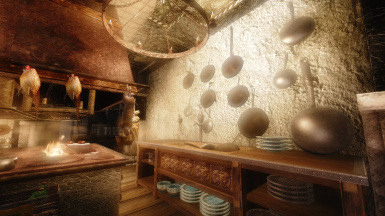 There are up to 14 new guests NPCs and many of them are merchants, and most of them will actively go out to the city, to the Solitude dock area and to the Bards College Festival to make the city look more lively. If you ever had a problem with this quest, such as the dialogue options with Elisif or Falk not showing, or the Hotel not be opened after waiting for 7days, your solution would be to download the "BAT File - No Quest" from the optional files section. This will immediately complete the refurnishing quest and make the Hotel available. Also, in some occasions, you might be going to see the iron bars to seal the entrance to the Pelagius Wing, even after you've helped them rebuild it as the Pelagius Hotel. This is a nasty bug; These bars are supposed to be disabled as you finish the renovation quest, "A Pair of Wings Restored". Typing in this line will resolve this issue by removing those bars. You don't need the BAT file mentioned above to use this feature. Some changes from Unofficial Skyrim Legendary Edition Patch have been implemented. This aims to avoid any issue by overwriting crucial changes by USLP and to help those who don't play with the patch. as the court wizard,when she died. 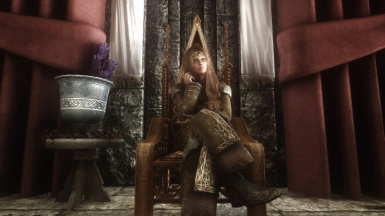 NOT COMPATIBLE WITH ANY MODS THAT ENABLE YOU TO KILL ELISIF OR MAKE ERIKUR THE JARL OF SOLITUDE! or the NPCs in Blue Palace excluding Elisif, Falk and Sybille should not be compatible. 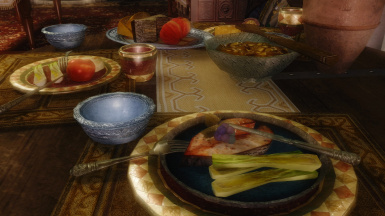 Please note: If you use TES5EDIT, I suggest you to delete the cell record "SolitudeBluePalace" from your lighting mod, instead of using this patch to consume your precious load order. Please remember that these patches are only alternative to those who don't like using TES5EDIT, or isn't skilled enough to do so. Make sure to download the patches from the optional files section if you use these 2 mods! especially in Sybille Stentor's lab where the mod authors like to put their "vampiric" stuff around. in these rooms would be impossible to obtain with my mod installed. 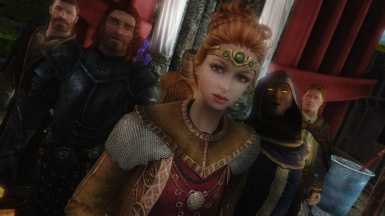 The users with Interesting NPCs and Inconsequential NPCs have the main file of the mod with built-in compatibility so you don't need any extra patches to go with these awesome mods. 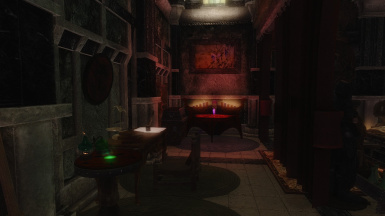 In the Interesting NPCs compatible version, Nythriel, a high-elf NPC who lives in Blue Palace, will have her own bedroom designed and dedicated for her. Solitude Towers Flags by iLita adds flags on the top of the towers and the palace. Highly recommended. 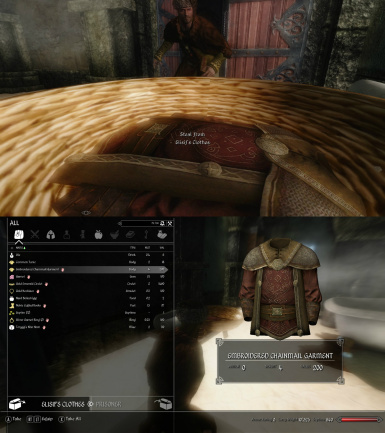 Noblesses Oblige by jacknifelee has a file to replace the Jarl's dress and the fine clothes with the new, more beautifully decorated ones. You may use it with my my mod to dress up Elisif and Falk without any problems. Lind's Court Wizard Robes - Blue Robes Texture Replacer by Lind001 is a retexture for the blue robes. The blue robe texture used for Sybille's unique robe is from this mod. I recommend you to check out every work Lind has released. A city overhaul mod for Solitude is definitely a great addition, and I highly recommend you to use your favourite one. 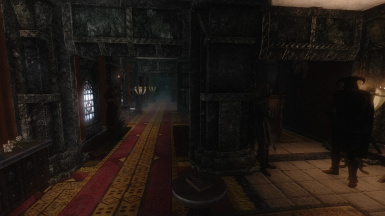 Solitude is my favourite city in Skyrim and this Blue Palace mod is my approach to enhance its attractiveness. and also the noble furniture to make the palace look beautiful. Just so you know, Ultimate Solitude by grVulture is my favourite Solitude retexture mod by far. Palace of the Kings (Windhelm) too! If you find any problems, or encountered some issues please go post your comment in the Posts section. I'm always happy to hear your feed backs and willing to answer your questions given some time as much as 1~5days. Please be constructive when posting your comments and it'd be sooner to be able to get back to you. I am truly grateful for all those who have supported me with their wonderful creations which made my mod possible to be made, and with their kind words which was the source of my motivation in creating. The following is the list of the people I would like to thank for granting me the exceptional permission and openly shared their great works with me, even though they were not uploaded as resources originally.